I love fruit. Growing up in Brazil the fruit there was always very ripe and sweet. One of my favorite desserts was a fresh fruit salad. There were some fruits that we weren't able to get in Brazil though. Mostly the fresh berries and peaches. Every time we would come home to the United States, I would go crazy eating all the American fresh fruit. 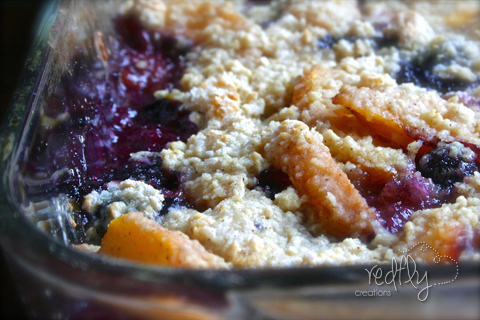 About 7 years ago I came across this wonderful recipe using two of my favorite American fruits- Blueberries and Peaches. Over time I made a few tweaks of my own. I am excited to share this recipe with you. 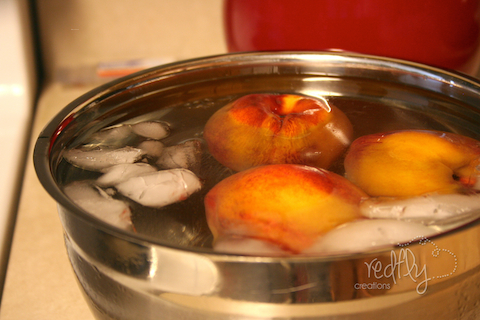 For several years I was intimidated to cook with peaches because they were so hard to peel. Little did I know there was a simple trick that made peeling a piece of cake. Maybe all of you know this already and I was the last to find out, but I thought I'd share this easy 3 step process just in case there is someone else out there who was like me. Fill a large pan with water and bring it to a boil. 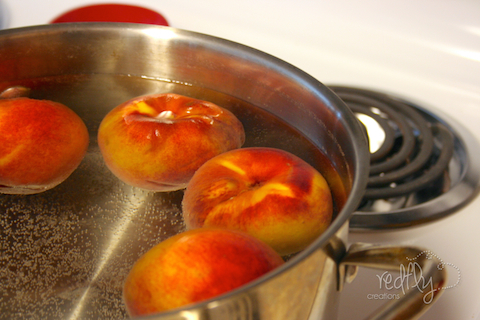 Drop your peaches into the boiling water for 30 seconds or less. If you are baking with them, as we are, a few more seconds won't hurt them. They'll just be a little cooked already. Dish them out with a slotted spoon, and drop them into another large bowl of ice water. They can stay there until you are ready to peel them. Take them out of the water, and the peelings just pull right off the peach. Now that is some easy peeling! 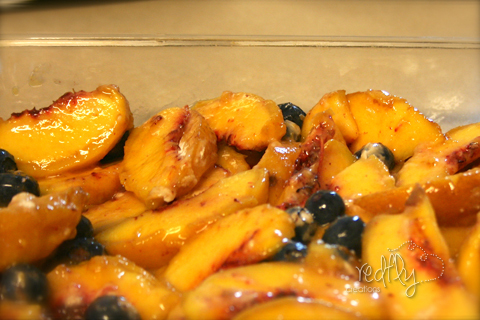 It sure makes baking with peaches a cinch. IF your peelings are not coming off easily, drop them into the boiling water again for a little longer, then into the ice water--the peelings should peel off easily. 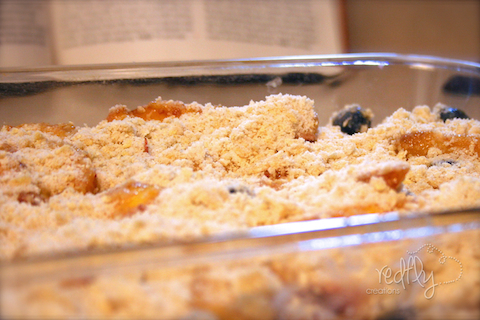 Mix the flour/sugar in with the peaches and blueberries. Toss to coat. Pour over the blueberry/peach mixture. P.S. You can substitute the peaches for apples - it is just as delicious. delicious. 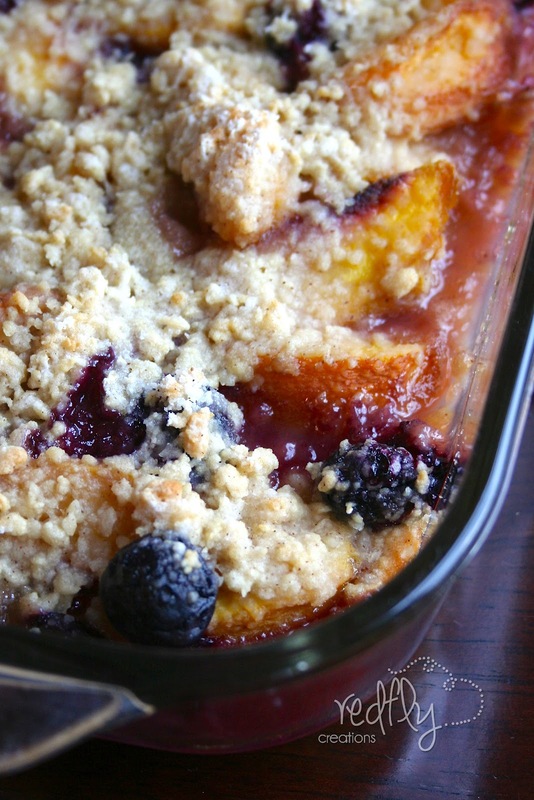 I never thought to peel my peaches before putting them in a cobbler or crisp but I think you are on to something here: I always hated eating that baked peach peel and now I don't have to! 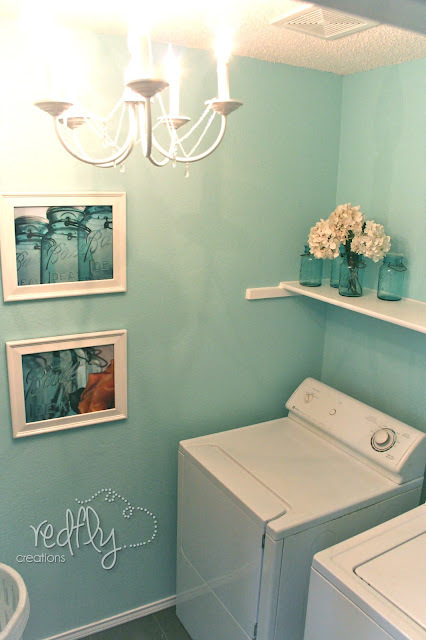 I came over from NapTime creations link up, I'm excited to see more of your creations. Oh, So glad that someone else had the same dilemma I did! :0) Glad you don't have to be eating peach peels anymore. 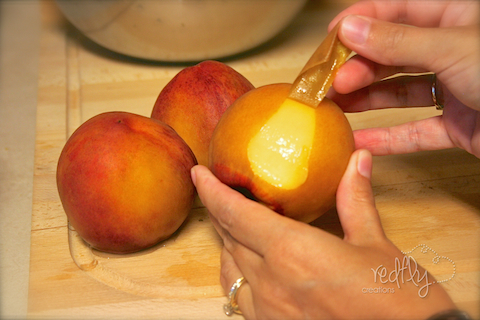 First: Great tip on peeling peaches! I never knew you could do it that way! Second: This looks so delicious. I made this today and just wanted to check that the amount of butter is correct. Mine was not at all crumble, but more the consistancy of an oily cookie dough. I added a little oatmeal to try to fix it. It still tasted wonderful! Could the butter amount be 1/2 stick butter instead of 1/2 cup butter??? I'm sorry you had trouble with too much butter. The recipe is 1/2 a cup. However, I would start with half a stick (1/4 cup) and add a little more if you need to. As strange as this may sound, I often had trouble with the 1/2 cup of butter as being too much liquid when I lived in Ohio, and had the oily cookie dough texture. It still turned out---it was just more "poofy" and less "crunchy" after baking. After moving here to Texas the 1/2 cup has been just right. The only thing I can imagine is it's dryer here. That probably isn't very scientific.....but that's what I've observed. All that to say......I guess just adjust it for you and start with 1/4 cup first. Is this recipe for a 9 x 13 dish? Or an 8 x 8??? 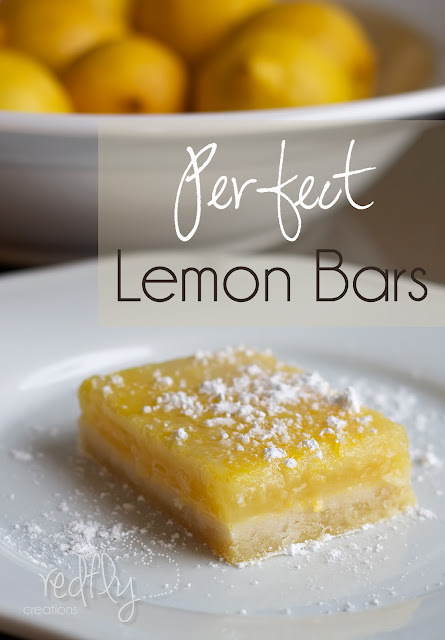 This was quite tasty, but the half cup melted butter did not produce a crumbly topping. I, too, live in a dry climate and still got a sticky cookie dough type of texture. It tasted good, and don't necessarily need to change it, but might try cutting in a quarter cup cold better next time to get a more traditional topping. Thanks for the recipe! I just made this recipe and also found that my crumble topping was not crumbly at all once I added all of the ingredients, and was instead a soft cookie dough/batter texture. I added more flour, sugar, and some oatmeal to try to get it crumblier, which didn't really work, so I just spread out the dough over the entire top. I think that either using 1/4 cup of melted butter and no egg could yield a more crumbly topping, or instead of melting 1/2 cup of butter, keep it well chilled and try cutting it into the dry flour/sugar mixture with a fork to make crumbs. After reading the comments about the butter, I decided to used the 1/2 cup recommended in the recipe but omit the egg instead. This actually crumbled into the perfect topping and I can't believe how much it actually makes! I used a 9x13" pan and it was loaded! 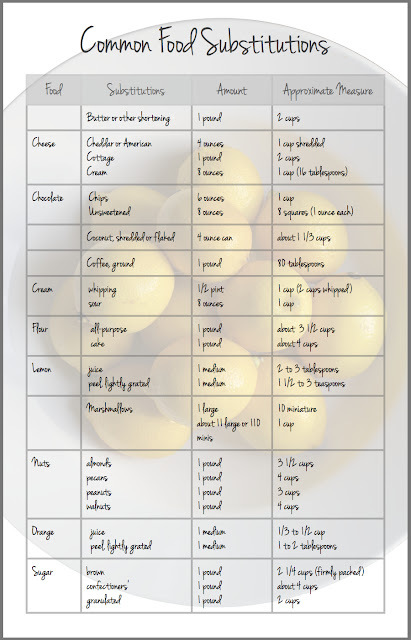 Great recipe, I'll definitely be making this one again. Also, I added about 1/4 - 1/2 tsp nutmeg into the flour/B.sugar fruit coat. AWESOME! 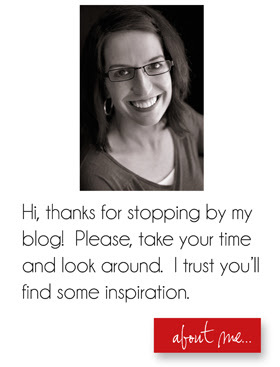 You have a beautiful blog here. I've enjoyed looking around and reading your story. I loved the Amish Cinnamon Bread! I'm thinking about trying the recipe above. 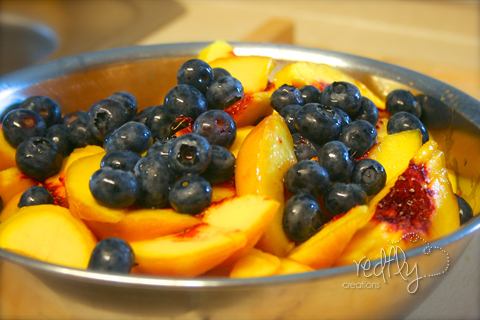 I love both peaches and blueberries. Interesting thing about peaches, this is a tip my grandmother taught me. They don't do well in pies or cobblers but when I'm making peach jam. The peels or I should say the fuzz of the peals completely dissolve and leave no weird texture behind. I've even made jam from peach peels alone. When I peeled them with a pairing knife. It sounds really strange, but peach fuzz makes a pretty rocking jam. Wow! I'd never heard of that Toni. I'll have to try it. Thanks for sharing!